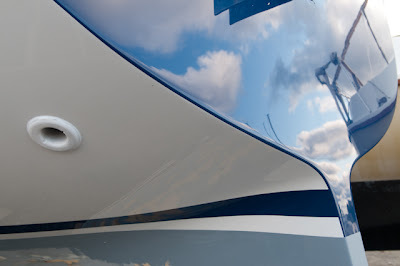 Take a look at the SHINE on Ravat's new transom! WOW! And there's no more sign of the old "Cap N Crunch" logo which drove me insane. The topsides are looking just as good. Sort of like looking into 3 feet of milk on a sunny day. It's just stunning. The job was a lot more money than I wanted to spend, but I have to say, she looks like a new boat above the water line. If you're anywhere near Rochester, NY and need paint or glass work done, talk to Chad at Shumway Marine. He is a real master of his craft, and from the moment you speak to him you feel confident about his ability to deliver. Not only is the topsides looking new, but the gelcoat job on the side-decks is fantastic. gain, a fantastic job by a real professional. I managed to get it a bit dirty before taking a picture, but it sure is nice to see white again rather than the epoxy filler! Now I just need to get the windows installed and the toe rails & jib tracks back in place so she's water tight again. 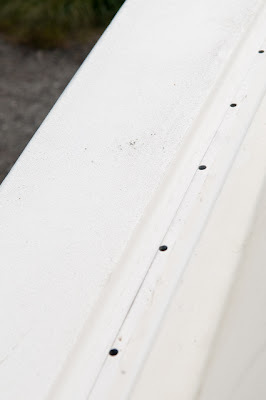 The storage compartment under the starboard settee was almost completely full of water. Not fun.